Marketers have the best job in the world because their tasks are so varied. Each day brings a diversity of challenges and various projects that can be looked at from different perspectives. Still ... you have to watch out for pitfalls, because task management may nevertheless turn against you. No clear overview and no insight into tasks is a surefire recipe for stress and can lead to burnout in the long term. Husky can help you with this through its two-pronged approach. On the one hand, you can schedule your tasks and enrich them with a priority, a status, extra information, a manager, a reminder (alert), a discussion and an attached file or document. The quickest way to access your task overview is to click on the "Tasks" tab in the left navigation menu. This shows your tasks as a standard. Use the filter to view your colleagues' tasks. Click on a task to change it or enrich it with data. You can change the date, priority and status from this screen at the click of a single mouse button. 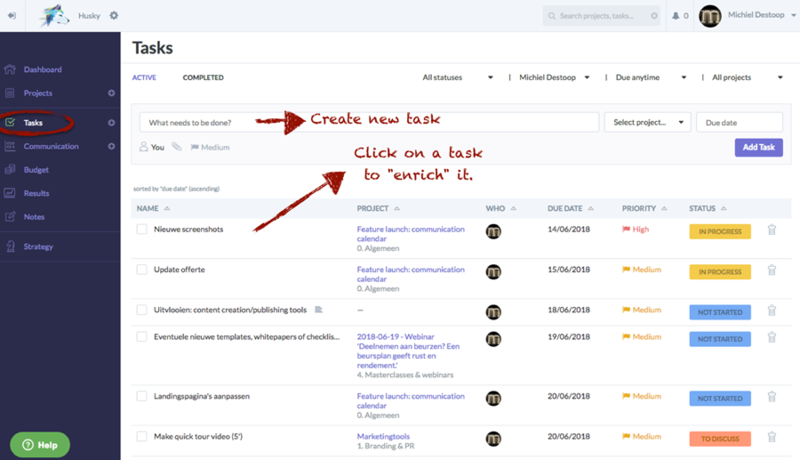 Tasks can be checked off to the left of the task description, after which they will automatically be moved to the archive. On the other hand, you can link each task to the right project in Husky. 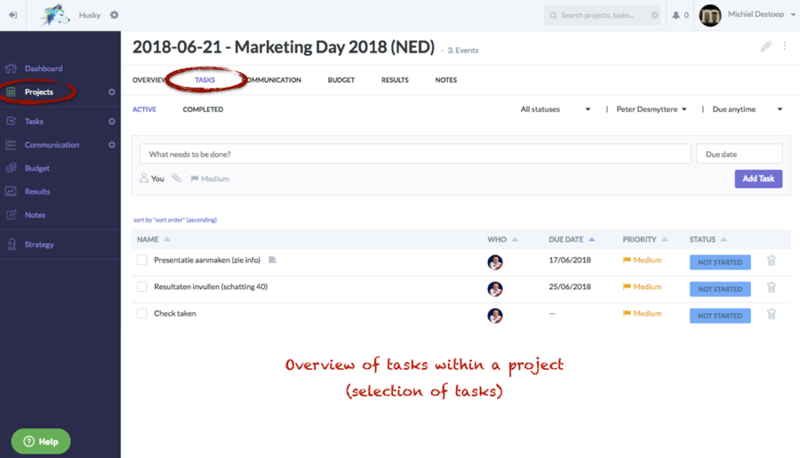 Your list of pending and completed tasks can quickly be viewed and managed from the project view. This is the perfect place for discussing project tasks in a meeting or creating a checklist of tasks or a task template (e.g. for recurring events).